While coloring may seem like an activity reserved for preschoolers and young kids, the recent trend of adult coloring books has more people interested in the benefits coloring can offer well after grade school. Adult coloring books often feature much more intricate scenes or partially finished doodles designed to spark your creativity. Nature scenes, motivational quotes and mandalas are all common subject matter. 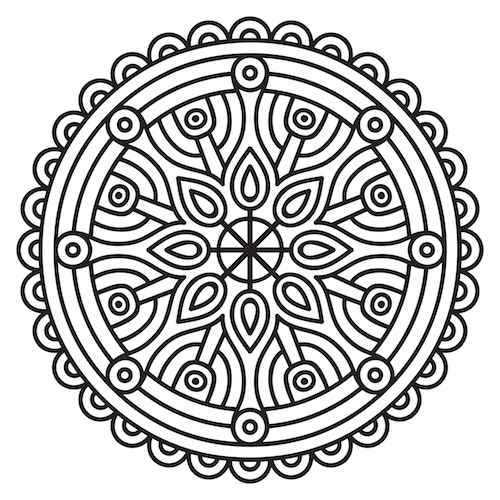 Mandala coloring in particular can be a simple way to reap the relaxing benefits of this ancient spiritual art. Native cultures across the world, including Native American tribes and Tibetan Buddhist monks have used mandalas in their spiritual practices for centuries. The world “mandala” is Sanskrit for “sacred circle.” Mandalas are always circular, but they can have limitless variations in the intricate patterns and designs inside. Mandalas were traditionally created by painting the designs on various types of surfaces or using colored sand to create the mandala on the floor. Decrease stress. Coloring mandalas takes a great deal of focus; you have to decide which colors should go in which spaces and work carefully to stay within the detailed line work. Focusing on these aspects helps the other problems and issues in your life start to slip to the back burner of your mind. Ease depression and anxiety. While coloring mandalas is not a substitute for seeking professional help, coloring has been shown to help with the physical and psychological symptoms associated with mild depression, post-traumatic stress disorder and anxiety. One possible reason is that the repetitive motion of coloring acts as a self-soothing behavior. Cultivate your creative side. Coloring in any form gives you a way to express yourself without worrying about what anyone else thinks. Put red and purple in the same space, color outside the lines or add more line work. Coloring as an adult can help you get back in touch with your younger, less stressed self. While mandalas are some of the most popular designs among those looking to use coloring as a way to reduce anxiety or carve a few minutes of active meditation out of the day, the adult coloring book market is expanding by the day. If you’re looking for a happiness boost, consider books and pages focusing on favorite scriptures, motivational phrases or flowers. Nature and ocean scenes can help you feel more centered after a long day at the office, and books that let you finish and then color your own doodles and designs can give you a feeling of accomplishment at create your own one-of-a-kind piece. If you’re ready to give coloring another try, check out your local bookstore or arts and crafts supplier. 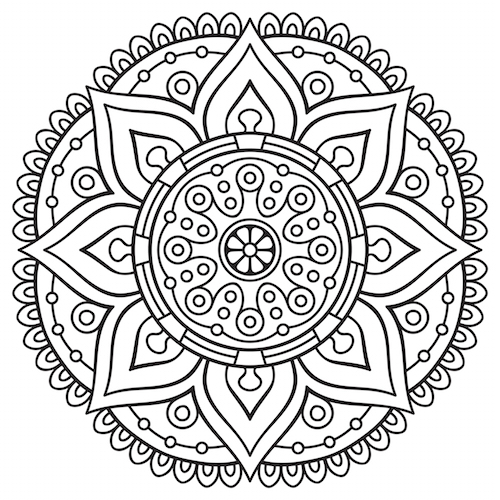 For those wanting to start small, there are many websites that offer free printable coloring pages featuring a variety of mandalas and other designs.